Analysis: Mad or glad over finale? Saturday was one of those games that created conflicting emotions. Should fans be happy that Miami scored in the final 90 seconds to pull out the tie, or should they be upset that the RedHawks had a 2-0 lead and let it dissolve? Or maybe some of both following a 3-3 final at North Dakota’s Ralph Engelstad Arena? REA is one of the most intimidating rinks in the NCAA for opponents, and jumping out to a two-goal lead there is impressive. So is tying the score in such a hostile environment with time running out. The three goals allowed in between, a little less remarkable. Teams like North Dakota (7-2-3) are more than capable of blowing up a two-or-more goal lead – as the Fighting Hawks proved last night – and elite teams are able to fend off such surges most times. Then again, a lot of teams that bent like Miami did, falling behind a goal with under four minutes left, would have broken rather than battle back for a tie. 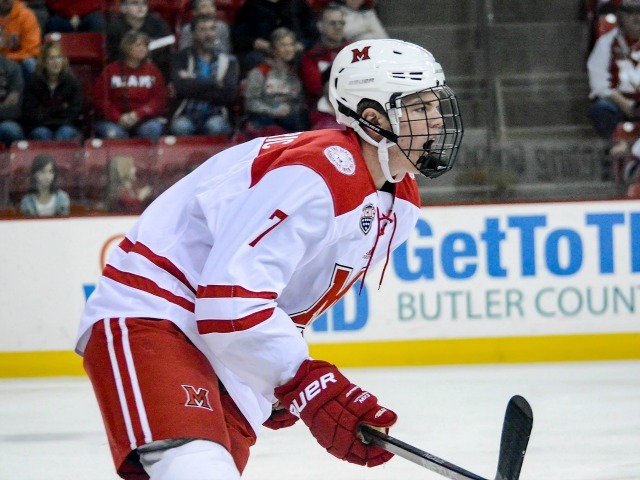 Things change quickly during a college hockey season, but at this snapshot – 10 games into 2017-18 with a 4-5-1 record – the RedHawks (4-5-1) are clearly not at elite status in Division I. But they’re definitely not a bottom feeder either. 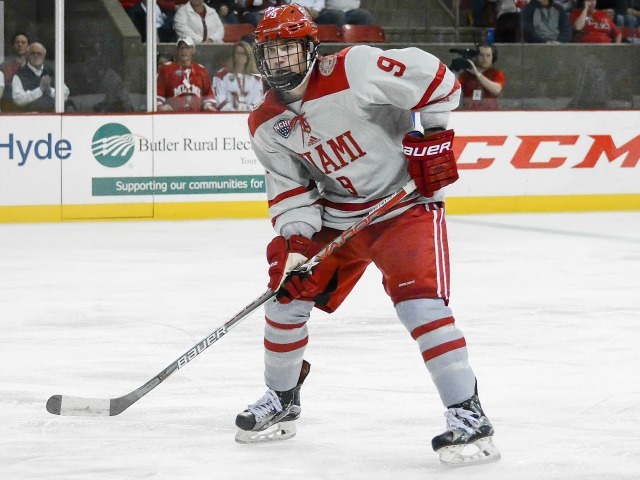 – Josh Melnick is building one of the best clutch goal-scoring resumes of anyone to wear a Miami hockey sweater. 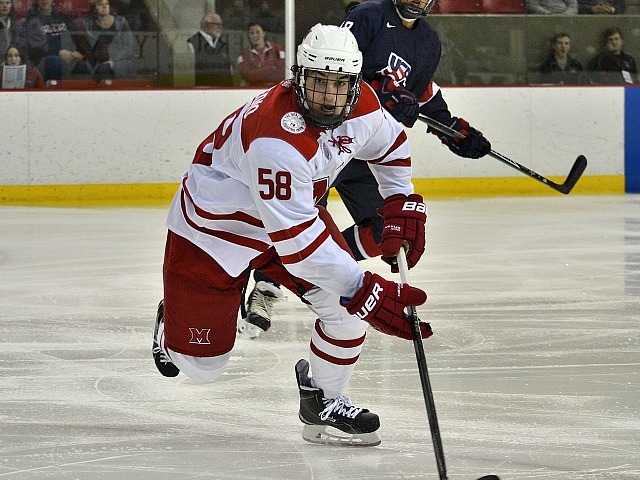 He scored the tying goal with under two minutes left on Saturday and had the winner vs. Colorado College on Nov. 3. 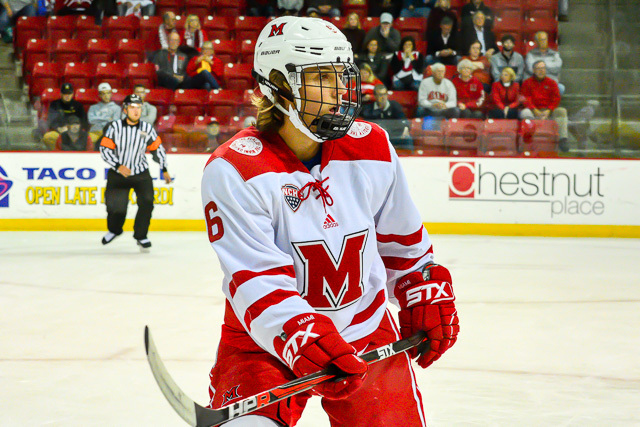 The RedHawks have won four games in overtime since Melnick joined the team in the fall of 2015. Melnick has three of the game winners in those contests. – Grant Frederic had logged two games this season and was 0-3-3 with 31 shots in 30 games for his career prior to this series. He fired nine SOG and picked up a pair of assists for the weekend. Meanwhile, fellow blueliners Grant Hutton and Louie Belpedio – who were lighting up the scoreboard – combined for just five shots in the two games. – Really like the progress we’ve seen from Ryan Siroky this season in every aspect of his game, and he had one great play and one not-so-great one in this game. Siroky backhanded one for his first goal of 2017-18 in what was not an easy play. But he lost his glove in the defensive zone later in the game, and rather than play without it he took a stride forward to reach for it, losing his opponent in the process and ultimately resulting in a goal. He has a goal and an assist in the past three games. – Coach Enrico Blasi had stood pat with his starting 19 in recent games, but he made substantial changes this weekend. Two moves stood out, and it’s unclear if they were healthy scratches or injured. On Friday, D Scott Dornbrock did not dress for the first time in over two years and Saturday F Kiefer Sherwood missed just the third game of his two-plus season career. Frederic dressed on defense both nights, as Dornbrock was not in the lineup on Friday and Rourke Russell sat for the first time this season on Saturday. With Sherwood and Austin Alger both out up front on Saturday, Willie Knierim saw his first action of 2017-18, and Christan Mohs played for the first time in six games. 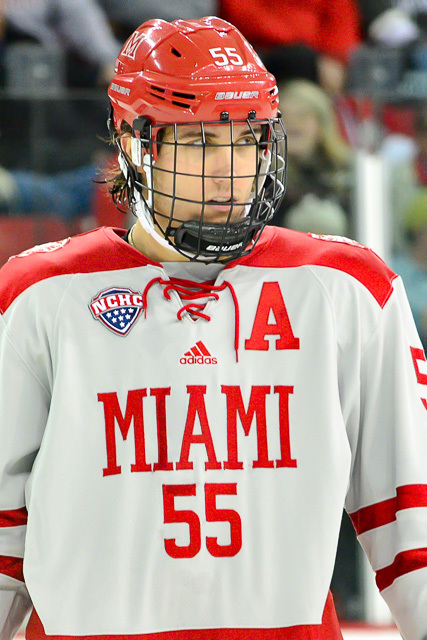 For the second straight night, Miami fell a goal short, and for the ninth straight game, the RedHawks came away without a win. 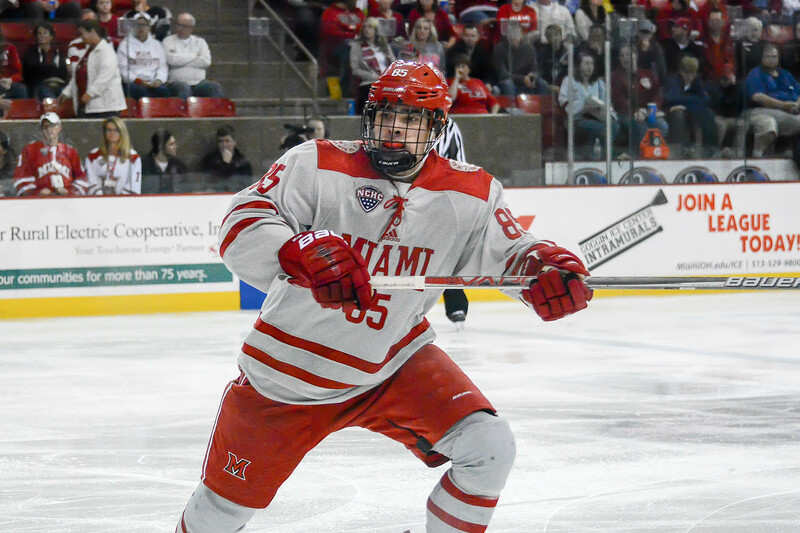 Miami dropped a 2-1 decision at Cornell on Saturday and is now mired in its longest winning drought in a quarter century, as the RedHawks are 0-7-2 since their last victory, which came on Oct. 28. The last time Miami (3-8-4) suffered through a skid this long was in 1990-1991, when the RedHawks played 17 consecutive winless games. The Big Red took the lead 10:53 into the first period when Dan Wedman whipped a shot from just inside the blue line over the shoulder of Miami goalie Ryan Larkin. Cornell (7-3-1) made it 2-0 just 98 seconds into the middle period when a shot from along the wall was tipped by Jake Weidner, popped over Larkin and into the net. The RedHawks’ lone goal came exactly three minutes into the third period. Josh Melnick won an offensive-zone faceoff back to Grant Frederic, who threw the puck off the end boards, and the carom was backhanded in by Carson Meyer. Meyer has scored in both games since returning from an illness. Frederic earned his third assist of the season and Melnick picked up his third helper of the weekend. Miami outshot Cornell, 12-3 in the third period – and 26-20 overall, leading the Big Red in that department for the second straight night – but was unable to pull even. 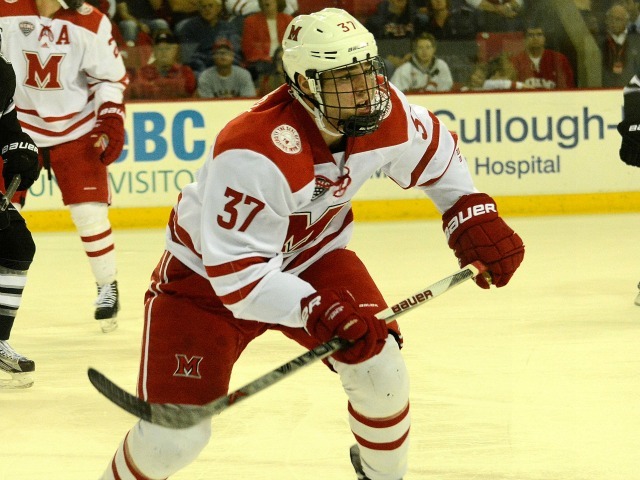 The RedHawks were swept in a weekend series for the third time this season. Entering this weekend, MU had lost just one one-goal game, but in addition the slim losing margin in this game, it suffered a 4-3 defeat on Friday. The RedHawks return home and will face Colorado College next Friday and Saturday at 7:35 p.m. and 7:05 p.m., respectively. Those will be Miami’s last home games of the calendar year.